Georgia Southern ranked in the top 5 percent of schools for gender diversity according to College Factual. Our Army ROTC program is the 28th largest producer of Officers for the Army out of 272 Host Programs across the Nation. Additionally, we are a Top 10 producer of Nurses for the Army. Georgia Southern University is one of six postsecondary institutions included on the prestigious 2018 Green Ribbon Schools list by the U.S. Department of Education for its environmental accomplishments. Areas of recognition include sustainability, health, physical education, safety policies, food service and environmental and sustainability curriculum. Nine colleges, schools and departments offer 141 degree programs at the bachelor’s, master’s and doctoral levels on three campuses – Statesboro, Savannah and Hinesville. Currently, Georgia Southern University’s total enrollment stands at nearly 26,500 students from all 50 states, Washington D.C., Puerto Rico, the Virgin Islands and 102 nations. Georgia Southern is partnering with the U.S. Air Force to help active-duty, National Guard and reserve personnel pursue education through the General Education Mobile (GEM) program. GEM is a landmark partnership between Air University, the Community College of the Air Force, and civilian academic institutions. Georgia Southern’s participation in the partnership makes the University one of only 96 institutions of higher learning where airmen are approved to take classes remotely. Members of the Air Force, especially those serving in the Georgia Air National Guard, who want to pursue a civilian education in a traditional setting will be able to attend classes at Georgia Southern’s campuses located in Savannah, Statesboro and Hinesville. The consolidation of Georgia Southern University and Armstrong State University went into effect Jan. 1, 2018, a year after the University System of Georgia Board of Regents announced the plan to consolidate Georgia Southern and Armstrong State. Georgia Southern is now the fifth largest public university in Georgia and the largest south of Atlanta. Georgia Southern ranked in the top 5 percent of schools for gender diversity according to College Factual. In the 2019 rankings for gender diversity at colleges and universities nationwide, Georgia Southern University ranked No. 82 out of 2,486, with a gender diversity of 49.1 percent male and 50.9 percent female. College Factual analyzed the age, gender, race and location of origin of enrolled students to rank colleges based on diversity. 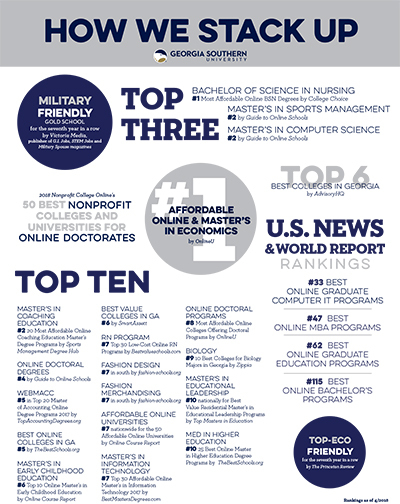 Georgia Southern ranked above the national average in all measures. In 2017, Georgia Southern University established its first permanent scientific field station known as the Effingham Wetlands. The property of about 1,400 acres, is located in Effingham and Chatham counties. Georgia Southern University’s Department of Biology is the largest center for biology research and education in southern Georgia. Georgia Southern’s Allen E. Paulson College of Engineering and Computing opened the state of Georgia’s first undergraduate Manufacturing Engineering program in August 2015. Georgia Southern University has been named a top four-year university on the Phi Theta Kappa’s 2018 Transfer Honor Roll for creating pathways to support transfer students. It was recognized on a list of only 112 colleges and universities in the U.S. The Georgia Southern University Armstrong Campus in Savannah is a designated National Center of Digital Forensics Academic Excellence. The University is one of only 14 institutions in the country to earn this designation from the U.S. Department of Defense Cyber Crime Center. The Armstrong Campus in Savannah was designated as the first college campus in the country to have a collegiate chapter of the National Latina Organization MANA, which represents the interests of Latina women, youth and families in the areas of education, health and well-being, financial literacy, equal and civil rights and immigration reform. The Eagle Battalion is proud to have the largest Army ROTC Nursing program in the nation. Georgia Southern’s School of Nursing is consistently ranked among the top in the country. The strong relationship between these elite programs has ensured that our Nurse Cadets receive top quality education and experience while being held to high academic and ethical standards, preparing them for becoming both Army Officers and leaders in the field of medicine. The Betty Foy Sanders Georgia Artists Collection, one of Georgia Southern University’s largest permanent collections, recently celebrated its 50th anniversary. The collection was established in 1967 by former Georgia first lady Betty Foy Sanders, a Statesboro native. Georgia Southern University’s accreditation has been reaffirmed by the Southern Association of Colleges and Schools Commission on Colleges (SACSCOC) through the year 2025. The reaffirmation demonstrates the University’s commitment to the highest educational standards. Georgia Southern University received an honorable mention designation for the 2017 Climate Leadership Awards from Second Nature and the U.S. Green Building Council. The Climate Leadership Awards recognize advanced leadership in sustainability, climate change mitigation and resilience at college and university campuses. The honorable member designation is the second highest an institution can receive. The finalists included only nine four-year institutions, among them, Furman University, Duke University, two Ivy League schools and three universities from California, all widely known and supported for their commitment to sustainability. Second Nature is a national nonprofit that works to accelerate climate action in, and through, higher education. The Georgia Southern men’s basketball program has finished in the top three of the Sun Belt Conference in three of their four seasons in the league. As of 2018, the Eagles are one of only three Sun Belt programs to reach double-digit conference wins in each of the last four seasons. Georgia Southern’s football program has a rich history, winning six NCAA Division I-AA National Championships before moving up to the FBS in 2014. In that first year, the Eagles won the Sun Belt Conference with a perfect league mark and won their first bowl game in school history a year later, trouncing Bowling Green 58-27 in the GoDaddy Bowl in Mobile, Alabama. A program-best eight former Georgia Southern football players were on NFL rosters at some point in the 2017 regular season: Matt Breida (49ers), Montay Crockett (Jaguars), Ukeme Eligwe (Chiefs), Edwin Jackson (Colts), Younghoe Koo (Chargers), Jerick McKinnon (Vikings), J.J. Wilcox (Steelers) and Antwione Williams. Georgia Southern sponsors 17 NCAA Division I varsity athletics programs, 15 of which compete in the Sun Belt Conference. Rifle competes in the Southern Conference while women’s swimming and diving competes in the Coastal Collegiate Sports Association (CCSA). The Georgia Southern men’s golf squad hosts one of the top college golf tournaments in the country each March in the Schenkel Invitational. Teams from around the country have descended upon Statesboro for nearly 40 years trying and tackle Forest Heights Country Club as they begin preparations for postseason play. Georgia Southern will host the 2019 Southern Conference Rifle Championships at the state-of-the-art, $5.8 million Shooting Sports Education Center in Statesboro. The 30,000-square-foot facility features indoor archery and firing ranges, as well as an outdoor archery range. The co-ed cheerleading squad claimed the 2017 National Cheerleaders Association National Championship, a first for the program. The all-girls squad claimed national championships in 2008, 2011, 2012, 2014 and 2015. Student-athletes continue to earn top honors in the classroom, as a total of 192 Eagles were named to the Sun Belt Conference’s academic achievement lists in 2017. The Academic Honor Roll recognized 100 Georgia Southern student-athletes with a GPA of 3.0 or higher. The Commissioner’s List recognized 95 Georgia Southern student-athletes with a GPA of 3.5 or higher. The Georgia Southern women’s basketball and men’s tennis teams earned Sun Belt Conference Team GPA Awards for the 2016-17 academic year. The awards, released at the conclusion of the academic year, honor the teams with the top cumulative team grade point average in each of the sponsored sports within the Sun Belt. Georgia Southern has fared well in the recent NCAA Graduation Success Rate reports. Men’s basketball, men’s tennis and women’s tennis all recorded a four-year weighted average of 100 percent in the most recent report and all 13 recorded sports at Southern recorded GSR’s above the national average. In addition to the three programs that recorded perfect scores, six other GS programs recorded GSRs of 85 or better, including women’s basketball (94), women’s swimming & diving (94), volleyball (92), men’s golf (91), women’s soccer (91) and softball (86). Georgia Southern University new $33.6 million Interdisciplinary Academic Building opens in the 2018-19 academic year. The 110,000-square-foot building on the Statesboro campus is designed to house teaching space for a variety of academic disciplines including interior design, fashion merchandising and apparel design, history, foreign languages, writing and linguistics, and international studies. Construction is underway on the building that will house the Waters College of Health Professions on the Armstrong Campus in Savannah. In the $22 million state-of-the-art facility, faculty will teach and train students in health-related fields ranging from nursing to radiology and sonography. Designed to simulate the environment of a hospital or medical facility, it will serve as a model for health care training and help meet regional workforce development needs. The building is scheduled to open in 2019. The R M Bogan Archaeological Repository is a new cutting-edge facility that houses Georgia Southern’s archaeological collections on the Statesboro Campus. Opened in May 2017 as part of the University’s new Central Warehouse, it is one of the largest archaeological research and curation facilities in the Southeast. With high-density shelving, climate control, acid-free boxes, electronic access doors and special collections storage units, the Repository allows thousands of artifacts and documents to be kept securely on campus. The $9.5 Military Science Building made its debut during the 2017 spring semester. The 32,000-square-foot facility has classrooms, a state-of-the-art computer lab, conference room with VTC capabilities, 25 Cadre and staff offices, and a 5,000 square-foot multipurpose room for a variety of uses from indoor trainings to events and ceremonies. The building also provides secure storage space for the program’s equipment. The Center for Wildlife Education and Lamar Q Ball, Jr. Raptor Center on the Statesboro Campus recently celebrated 20 years in operation. Since its opening, the Center has expanded from 4.5 acres focused primarily on raptors and reptiles to now 18 acres showcasing a waterfowl pond and cypress swamp among other exhibits. The Center supports Georgia Southern University’s environmental education programs by providing wildlife outreach, programs, tours and camps. Bright from the Start has awarded Georgia Southern University’s Child Development Center (CDC) the highest possible accolade, a three-star rating, on its quality assessment report, Quality Rated. Quality Rated is a system to determine, improve and communicate the quality of child care programs in Georgia. The system assigns a quality rating to early and school-age care and education programs that meet a set of defined program standards. Institutions volunteer to be observed by Quality Rated. Thousands of people in need of medical care can receive it at no-cost in May 2018 during Operation Empower Health – Greater Savannah, a U.S. Military exercise supported by St. Joseph’s/Candler and Georgia Southern University. Troops from all over the United States will deploy to Savannah and set up medical, dental, vision and veterinary services. This provides valuable training for the military and provide important medical services to those in southeast Georgia who might not otherwise have access. On Saturday, March 3, 2018, nearly 200 Georgia Southern University students, faculty and staff arrived on the Armstrong Campus in Savannah to volunteer for Treasure Savannah, a biannual day of service. Volunteers boarded buses to 13 service sites throughout Savannah and Hinesville, including Skidaway Island State Park, Keep Savannah Beautiful, Hoofs 4 Healing, Salvation Army, Habitat for Humanity ReStore, Georgia Regional Hospital, Second Harvest and Liberty County’s Humane Shelter and Manna House. Since Treasure Savannah’s inception seven years ago, the Armstrong and Liberty Campus communities have contributed more than 12,000 hours of service to various area nonprofits. The results of the 2017 fourth quarter (Q4) Georgia CEO survey suggested Georgia business leaders’ confidence levels had increased significantly since the third quarter survey. The purpose of the survey is to better understand how general business conditions are impacting Georgia CEO subscribers on a quarterly basis. Georgia CEO partners with the Center for Business Analytics and Economic Research (CBAER), formerly the Bureau of Business Research and Economic Development (BBRED), a member of the Georgia Southern University College of Business, to prepare, distribute and analyze the survey. In Q4 of 2017, survey participants showed a significant increase in confidence levels due to a perceived improvement in the overall economy, likely from the prospect of more business-friendly legislation. Looking ahead to Q1 of 2018, participants noted near record or record-breaking levels of optimism driven by the aforementioned factors and the passing of the new tax plan. The survey responses suggest general business conditions are improving across all categories throughout the state in Q1. The Department of Biology at Georgia Southern University and The Orianne Society, a nonprofit organization devoted to the conservation of amphibians and reptiles, have announced a partnership. The memorandum of understanding between the University and The Orianne Society is designed to enhance cooperation and further the mission of research and education by both partners. Georgia Southern University’s Department of Biology is the largest center for biology research and education in southern Georgia. Thus, for its part, the department will provide access to state-of-the-art laboratory space and equipment for scientists from The Orianne Society. Access to laboratory facilities will significantly increase the research infrastructure available to The Orianne Society and will facilitate mutually beneficial collaborations with the University’s faculty and students. Scientists from The Orianne Society will have the opportunity to work as visiting scholars in the Department of Biology. Scientists from The Orianne Society will also continue to contribute regularly to the Georgia Southern University herpetology collection, strengthening one of the largest collections of amphibians and reptiles in the Southeast. The Georgia Southern School of Nursing has received a $1.6 million grant to help better prepare students to work in the psychiatric/mental health care field through the new Behavioral Health Workforce Education and Training (BHWET) Program. The BHWET Program supports students in the Psychiatric Mental Health Nurse Practitioner (PMHNP) specialty track of the BSN-DNP program, and aims to develop and expand the behavioral health workforce for rural and medically underserved populations in South Georgia. Jose Sanchez, a graduate student in the Georgia Southern Department of Biology, received a highly competitive National Science Foundation (NSF) fellowship to conduct ecological research at the Cape Horn Biosphere Reserve in southern Chile. Sanchez was one of only three students selected to participate after a nationwide search. The fellowship was funded by a NSF International Research Experience for Students grant. The grant, administered by the University of North Texas, is designed to fund interdisciplinary research and biocultural conservation in the world’s southernmost forests. Georgia Southern University’s School of Nursing received a $1.3 million federal grant for an Advanced Nursing Education Workforce (ANEW) project that will create innovative academic-practice partnerships to prepare nurse practitioners for service in rural and underserved communities in Southeast Georgia. The grant will create partnerships between the School of Nursing and five federally qualified health centers (FQHCs) in order to increase the number and readiness of family nurse practitioner (FNP) and psychiatric/mental health nurse practitioner (PMHNP) students in Georgia. Georgia Southern’s College of Science and Mathematics has signed a memorandum of understanding with the U.S. Fish and Wildlife Service to allow University biology students and faculty to use the Bo Ginn Fish Hatchery as a resource to better understand the future of ecosystems in the southeastern U.S. Most of the experiments at the hatchery will explore the ways rainfall changes due to climate change will affect ephemeral ponds, which are vital habitats for many aquatic species in the region. Georgia Southern Waters College of Health Professions Assistant Professor Tamerah Hunt, Ph.D., has teamed up with researchers from the Seattle Pediatric Concussion Research Collaborative and Seattle Children’s Center for Childhood Health, Behavior and Development to develop the program, One Team, which addresses safety and concussion awareness in youth sports. The researchers received a $1.6 million grant from the Centers for Disease Control and Prevention to develop and implement the program in ages 9-13 youth football and soccer leagues in Puget Sound and southern Georgia.